Black-capped chickadee chicks, photographed in western Maine by naturalist and Notebook friend Bernd Heinrich last spring. Pamelia and I shoot a lot of pictures. We try to carry a camera at all times because nature sightings (and other memorable images) tend to be unexpected and fleeting. As we kick off a new year, we thought we would pull together some of our favorite outdoor photographs of 2013. We took most of them; naturalist friends shot others. We thank all of you who have shared photos this year with us and The Naturalist's Notebook audience—please keep them coming in 2014! A later view of the chickadee chicks, also photographed by Bernd. Evening grosbeaks in morning, January. A juvenile goshawk on our deck, January. On a winter trip to California to meet with Notebook collaborators, we stopped at the elephant-seal rookery near Hearst Castle in San Simeon. On a January/February trip to California to meet with a range of Notebook collaborators (located everywhere from San Diego to Berkeley), we stopped at the Northern elephant seal rookery at Piedras Blancas, near Hearst Castle in San Simeon. 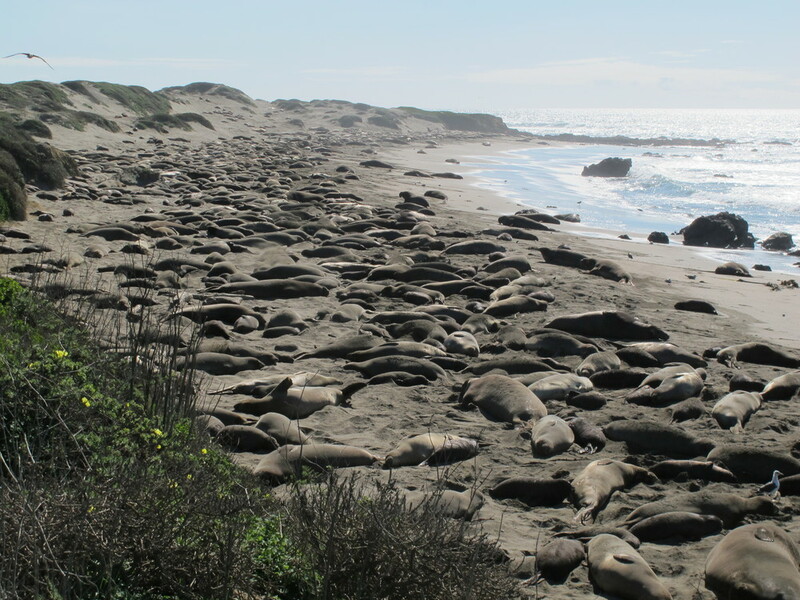 Some 17,000 elephant seals come here to breed, give birth, molt and rest. Elephant seals migrate as many as 13,000 miles a year—farther than any other marine mammal. By the way, if this were a Sounds of the Year blog, you'd now be listening to these one-to-three-ton creatures thunderously grunting and making assorted rude bathroom noises. 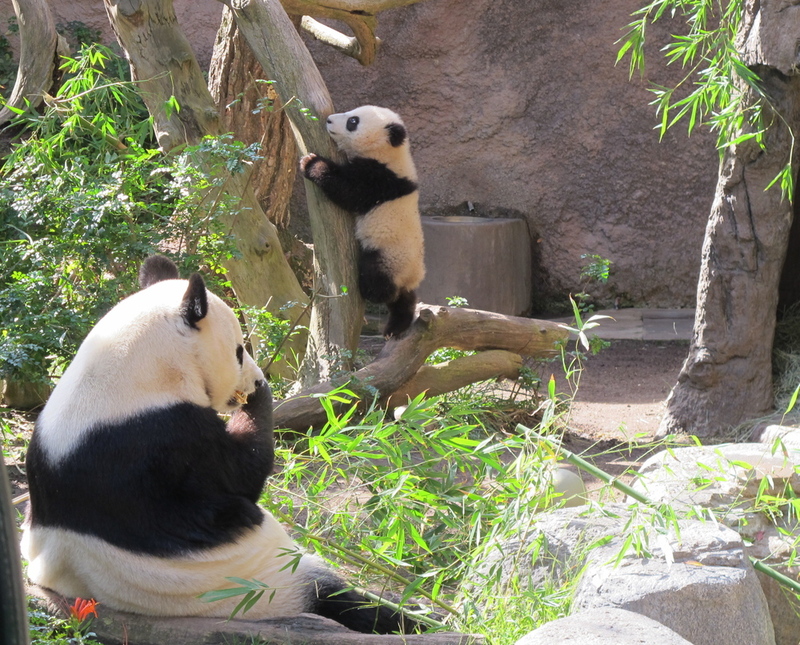 Pandas at the San Diego Zoo, January. Bonobos at the San Diego Zoo. Bonobos, which were once known as pygmy chimps, are humans' closest relatives along with chimpanzees—but we have pushed them toward extinction by destroying their habitat and hunting them as bushmeat. These flamingos, also photographed at the San Diego Zoo in January, serve as a striking reminder that we are what we eat. Their color comes from carotenoid pigments in their food. Eat enough carrots (which have the same pigments) and you'll start to see your own skin turning orange. Well, maybe not this shade. While in California we also stopped in Pismo Beach to see untold thousands of wintering monarchs, which had flown in from across the Western U.S. In our warbler-rich area of coastal Maine, we most often see the yellow-rumped variety. We photographed this one in March. Frog eggs in a vernal pool near our house, April. While doing research for a vernal pool diorama for The Naturalist's Notebook, we studied these frog eggs in a roadside pool in April. 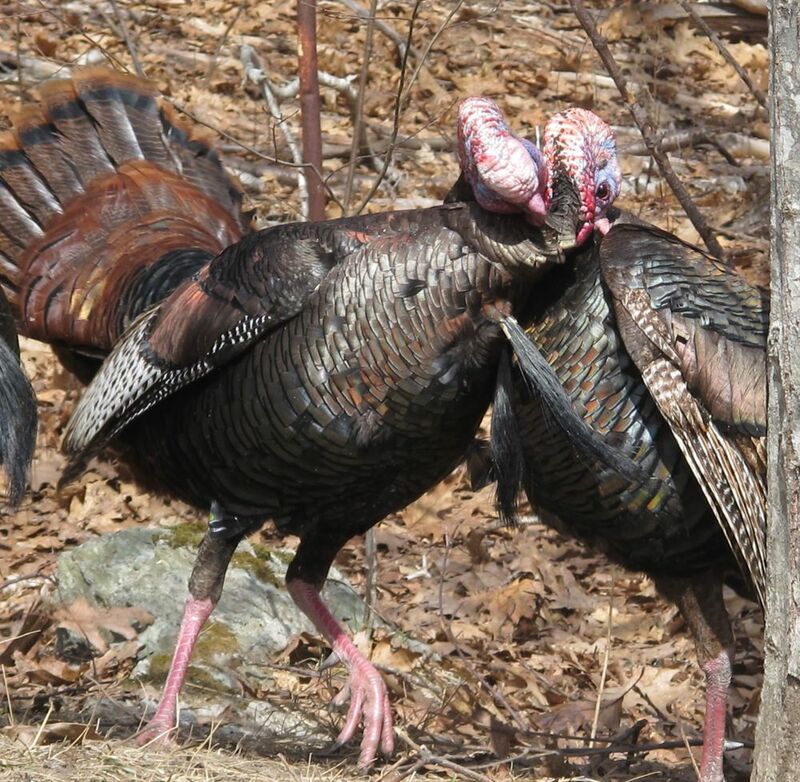 A wild-turkey fight next to our house in April. The two birds wrapped their necks around each other, pulled on their opponent's wattles and sometimes flew at each other, talons high. The loser walked away swollen around the neck but alive. In a remarkable coincidence, Pamelia and I found this piece of sea glass while walking along the shore near our house on the afternoon of the Boston Marathon bombing. We didn't realize the bombing had happened until we got home. This isn't exactly a nature shot, but it certainly was one of our more striking images of 2013. In an eerie coincidence, Pamelia and I found this piece of sea glass while walking along the shore near our house on the afternoon of the Boston Marathon bombing in April. We didn't realize the attack had happened until we got home. After I posted it on The Naturalist's Notebook's Facebook page, this photo was viewed by nearly 30,000 people. It later was published on the front page of the Mount Desert Islander newspaper. Ruffed grouse nestlings photographed by Bernd Heinrich. Notice how the shells are, in Bernd's words, almost surgically cut in two from the inside using the egg tooth on the tip of the baby's bill. How remarkable is that? Pasque flower, central Maine, April. Goat (I don't know the name), photographed in Maine by Notebook team member Claire Longcope. 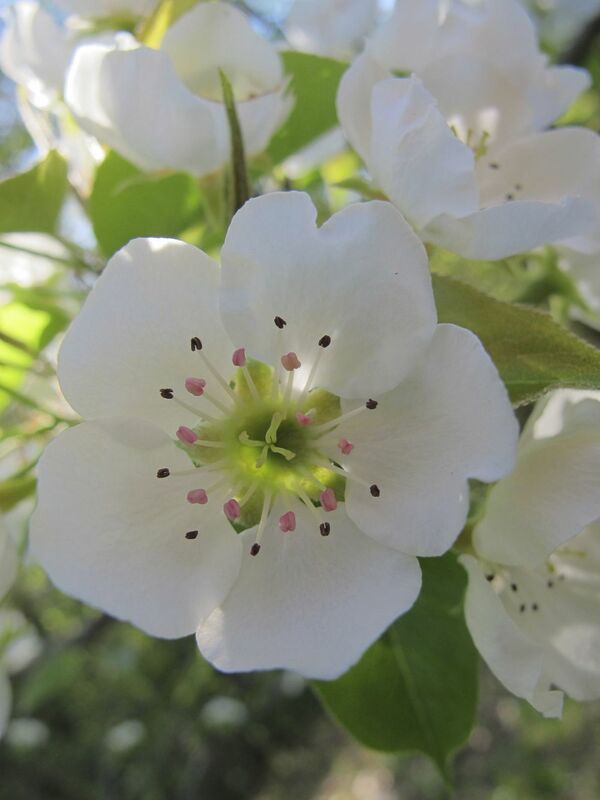 Pear blossoms in New Hampshire in May. Painted turtles, photographed in Maine in May by Notebook team member Amy Gagnon. Marceline the pygmy goat and two friends at the Sweet Pea Farm in Bar Harbor, June. Marceline the pygmy goat and two friends at the Sweet Pea Farm in Bar Harbor, Maine, in June. These phoebe chicks hatched in an eave by Notebook friend Leanne Nickon's art studio. Leanne didn't want to disturb the birds so she couldn't get into her studio for several days. Underwater view of vernal pool, early June. Sand dollars at extreme low tide in Seal Harbor in June. Sand dollars at extreme low tide on Mount Desert Island in June, photographed by one of the Notebook's favorite people, Dale Nat. Two black bears visited our house in in June and made short work of our bird seed. 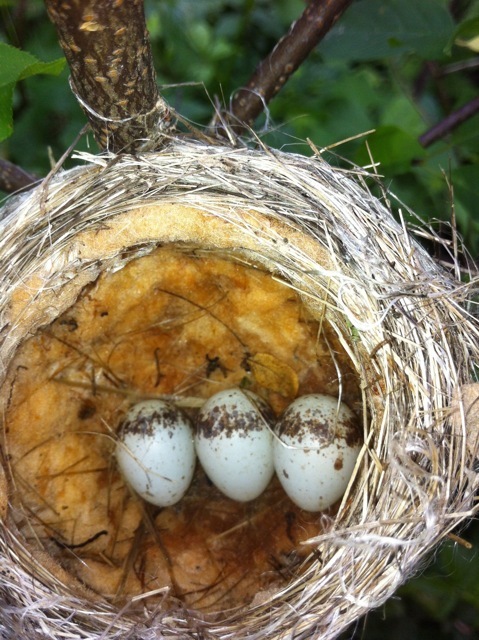 Yellow warbler nest photographed in Vermont in June by Notebook friend LJ. A yellow warbler we photographed at our house a couple of months later. 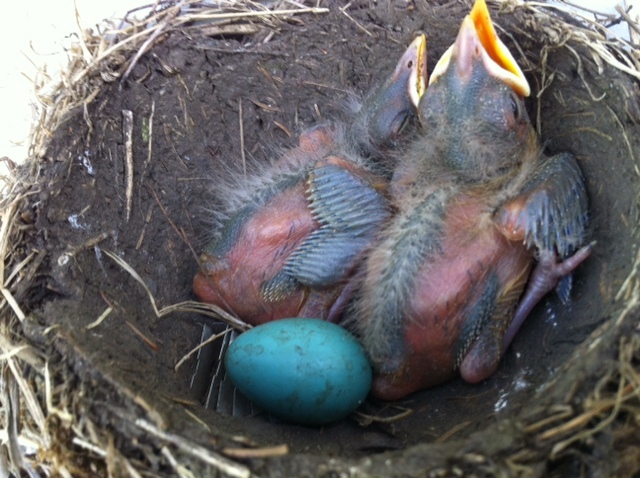 American robin nestlings and egg, also shot by LJ in June. Rosy maple moth on a telephone pole outside The Naturalist's Notebook in July. A rosy maple moth on a telephone pole outside The Naturalist's Notebook in July. Goldenrod crab spider, outside The Naturalist's Notebook in Seal Harbor, July. A little pollination action in late July in the garden in front of the Bar Harbor Notebook location we opened on Aug. 1. 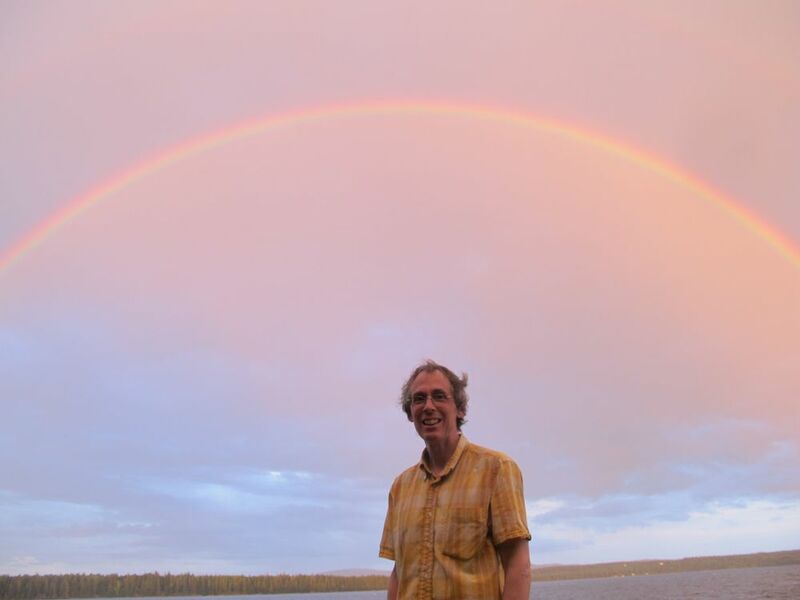 We enjoyed a full, double rainbow one afternoon in July. We explore the colors and science of the spectrum at The Naturalist's Notebook. One afternoon in July we enjoyed a full double rainbow's worth of spectral color. Flying ant swarm on Cadillac Mountain in August. Flying, breeding ant swarm on Cadillac Mountain in August. Dan McCoy of Pixar, who gave a Notebook talk on the making of the Oscar-nominated animated short La Luna, sized up La Luna while looking out from our Maine shoreline. Animation whiz Dan McCoy of Pixar, who gave a Notebook talk in August on the making of the Oscar-nominated short La Luna, sized up the real Luna from 240,000 miles away one evening while looking out at our bay. Phantom crane fly, photographed by Notebook friend Lindsey Bell. Milkweed bug larvae we discovered during a hike in Virginia in October. They were crawling all over inside the milkweed pod. After his wife, Gem, a Notebook team member, saw this juvenile Eastern red-spotted newt scurry into the underbrush on Maine's Mount Desert Island, Vincent Lawrence of Acadia Photographic Workshops searched for the elusive amphibian and finally found him. Vincent always gets the shot. I highly recommend signing up for a workshop or a day session with him if you're going to be visiting Acadia National Park in 2014. Our friend Vincent of Acadia Images Photography Workshops took this shot in Seal Harbor the other day. The cute creepy-crawly is an elm sawfly larva—and if you want to know how to tell a larva from a caterpillar, keep reading. Sawfly larva, also photographed by Vincent Lawrence. Porcupine hanging out in a spruce tree at our house, September. That’s Rocky, checking out the Maine coast from our 500-million-year-old Ellsworth schist—some of the oldest rock found in our area—on a September morning. Another Vincent Lawrence shot, of starfish in the waters off Mount Desert Island. A white tussock moth caterpillar, Maine, August. This gorgeous type of caterpillar transforms into a camouflaged tan and brown moth. Insect larva, photographed by James Cormier, October. Ice on our bay, November. A red-tailed hawk and its next meal, photographed by South Carolina naturalist and Notebook friend Bruce Lampright, December. And finally, because it brings back memories of a place much warmer than Maine is at the moment (sub-zero), a bird-of-paradise flower, San Diego, last January. And finally, because each year offers a new path and new promise, my favorite field scene, shot last August, with Sargent Mountain in the background.